Who knew? Use a Calloway, go to jail! How the yardage book developer came to be known as the "felonious golfer"
Oxnard City Code Sec 20-6. Playing golf on public property. Humorist Mark Twain defined golf as "a good walk spoiled." Webster's Dictionary defines it as "an outdoor game played with a small, hard ball and a set of clubs." Albert DeLorey believes the city of Oxnard has its own definition of the ancient game. In December, DeLorey was charged with playing golf in a public park. Listed under Miscellaneous in the Oxnard City Code, it is a misdemeanor punishable by a fine and no more than a year in the county jail. Who knew? Use a Callaway, go to jail. However, the 59-year-old retired electrical engineer denies he was playing golf. Yes, he was in a public park, and, yes, he was swinging a golf club. He maintains he was not playing golf because he was not hitting a hard, little ball. He was using a Wiffle ball, a lightweight plastic orb with dozens of tiny holes. It is a sphere so aerodynamically dysfunctional Tiger Woods could barely knock it the length of a Buick. DeLorey's brush with the law started when he was practicing his swing in an unoccupied neighborhood park about a nine-iron-shot from his Oxnard home. 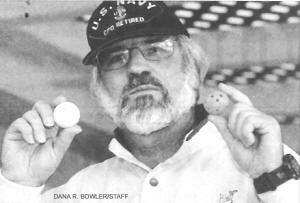 Golf is an equipment-intensive sport and so he lugged a few clubs and a fake turf mat so he would not kick up divots. He was armed with 50 Wiffle balls. The park is surrounded by about 15 homes in a gated subdivision. Most likely one of those residents phoned in a complaint to Oxnard police. Two officers responded and indicated it was their opinion DeLorey was violating the code. He argued his case and the officers left. Convinced he was doing nothing wrong, he continued to practice in the park with the plastic balls. Convinced DeLorey was a menace to public safety, the citizen kept complaining. At one point a code-enforcement officer arrived. Armed with a condensed book of Oxnard codes, she ruled plastic balls were allowed. Days later, the spoilsport phoned in another complaint and a police officer came to cite DeLorey for misdemeanor hacking. His case will be heard in Ventura County Superior Court next month. There is irony here. You see, DeLorey lives on the 13th tee of the city-owned River Ridge Golf Club. His house is subject to incoming balls from poorly executed chip shots intended for the 12th fairway. These duffers do nothing illegal, although the potential to cause injury or property damage exceeds any havoc that possibly could be wreaked by a Wiffle ball. This tees off DeLorey, so his dining room table has become headquarters for his defense in the case of the People v. DeLorey. The case already has cost him a lot of green. 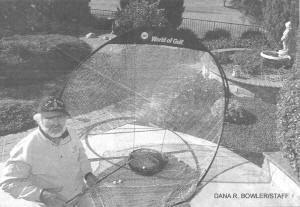 He purchased calipers to measure the diameter of the Wiffle ball and a regular golf ball. He ordered 19 copies of the U.S. Golf Association handbook so he could hand them out to jurors should his case go to trial. He believes his innocence is proven by the USGA handbook. If he is convicted of the offense, he knows it's highly unlikely a judge will sentence him to time in the slammer. If you ask me, the worst possible punishment is that he gets to play such a frustrating game. He does worry about having a misdemeanor conviction on his record. He volunteers with the Ventura County Sheriff's Department's disaster relief squad. Since Sept. 11, the department has performed background checks even on volunteers. If he were to plead guilty, the fine would be $145. He has the money to pay it. It's the principle involved, he insists. Law enforcement should learn this important lesson: Never tick off a reasonably well-off retiree. He has time and money. As Mark Twain also remarked, "Principles have no real force except when one is well-fed." When it comes to the determination of one Albert DeLorey, Oxnard officials can consider themselves "fore!" warned. Colleen Cason's e-mail is ccason@insidevc.com. Her telephone number is 655-5830. Copyright © River Ridge Fairways.com. All Rights Reserved.